I have a lot of feelings about Star Wars. It’s Star Wars week! Finally, after months of anticipation, we’re going to see The Last Jedi on Friday and I am beyond excited. Over the last 3-ish weeks we’ve been watching all the Star Wars in canonical order (thanks to the awesome planning of Even aka @chimp) so that we can all be fully caught up/refreshed when we go into Friday’s screening. My feelings (beyond excitement) are mixed: I am worried that it will be terrible; unsure what they’re going to do with Leia’s character after Carrie Fischer’s tragic and unexpected death; hopeful that my theories will be correct; and looking forward to seeing what Rey and Finn and Poe and Kylo Ren – all the great new characters – get up to in this story. I’ve really been enjoying re-watching the movies and, since Friday we finished the original trilogy, I thought I’d write a blog post about all my complicated Star Wars feelings in the hopes of sorting some of them out. First of all, the prequel trilogy is terrible – my feelings there are not at all mixed. They’re just really bad, full stop. I must confess that I have a soft spot for The Phantom Menace because I saw it for the first time when it came out in theaters in 1999 and I was too young to realize that it was so awful. Re-watching it, I feel like parts of it are okay – the podrace scene holds up, and Padme and Qui-Gon are still pretty cool characters – but now that I’m aware of the racist stereotypes that underly a lot of characters, it’s really hard to watch. We talked quite a bit during the screening about the things we found problematic representations of the Gungans and Trade Federation characters in particular – I’m grateful for the conversation, but I wish it was one we didn’t have to have. I found Attack of the Clones and Revenge of the Sith completely unwatchable and skipped them – I’ve never liked those movies and don’t regret it. Moving on, I was surprised how much I enjoyed re-watching Rogue One. The only time I’d seen it was when we went last year to the premier. I remember being surprised then at the ending – I was expecting a much more Disney-ish conclusion, and obviously that’s not what happened. (Spoiler alert: literally everyone dies.) I thought the story was well-paced throughout the whole movie, the sets and special effects were beautiful, and I liked all the characters and thought they were well-acted (unlike in the prequels…). What I enjoyed the most, though, was watching it in the context of the other movies. We watched A New Hope the next day and it was weird to realize that the Death Star only really exists for a short period of time – weeks? – while it fully functional before Luke blows the whole thing up. It really helps explain why the Empire is so obsessed with building another one after the first was destroyed. Basically they spend all this time building the ultimate weapon, they use its full power once (sorry Alderaan!) and BAM! It’s gone. So, on top of being an enjoyable standalone movie, I really like the fact that it makes the larger story arc of the trilogies make sense by justifying the Empire’s obsession with planet-exploding superships. We watched A New Hope the day after Rogue One, and it’s so cool how seamlessly those two movies fit together. I saw A New Hope for the first time when I was 8 – I distinctly remember sitting with my godfather on my grandparents’ bed and watching the VHS on their tiny, wonky tv – and every rewatching is just me trying to recapture the magic of that moment. The beginning is slow, and strange after Leia is captured – we know the stakes are high and that something incredible is going to happen (We’re in space! There’s an evil guy in a scary suit! The princess is in trouble!) but we don’t know what yet. A New Hope trusts its audience to stick with it for a while while the story winds up: Luke is pretty whiney when we first encounter him, and we spend a lot of time with C3PO and R2D2 on Tatooine looking for “old Ben,” not sure how all these threads of storylines are going to come back together. It’s definitely worth it in the end – the scene where Luke bows up the Death Star is as awesome today as it was when I was 8. It’s either my second-or-third-favorite Star Wars movie – I’m having a hard time deciding if I like Rogue One more. However, I was struck, watching it, that aside from Leia and Luke’s aunt (Beru, whose name I had to look up) there are no women at all. In fact, even R2D2 is gendered male and he’s a cylindrical robot who communicates in whistles! (Other characters refer to R2 using “he/him” pronouns – we looked it up later an apparently it’s because he has “masculine programming” and excuse my while my eyes are stuck all rolled up inside my head.) Me voicing this realization about R2 resulted in an interesting conversation about gender-nonconforming and non-binary people (as I identify, myself) so that was at least productive and interesting. Thursday we watched Empire Strikes Back, which has always been my least favorite of the original trilogy, and I think I’ve figured out why: the Han/Leia subplot is super frustrating and nonconsensual. Basically Leia’s like “don’t call me sweetheart/don’t touch me/let’s not go to cloud city I have a really bad feeling about that” and Han is like “it’s fiiiiiiiiiine” and this makes me SO ANGRY. First of all, ignoring someone’s explicit request to stop touching them is never okay, Han (and it doesn’t make you a “scoundrel” *eyeroll*). Second of all, if everyone had just listened to Leia when they got to Cloud City and she was like “seriously I have a bad feeling here,” Lando wouldn’t have been able to betray them, Han wouldn’t have wound up frozen in carbonite and Vader wouldn’t have been able to catch up with them and cut off Luke’s hand. The only reason Luke survives the movie at all is because when he is dangling, one handed, off the bottom of cloud city he mentally calls Leia for help and she’s strong enough in the force that she hears him and has Lando turn the Millennium Falcon around to go rescue him. Then Friday we watched Return of the Jedi, my absolute favorite Star Wars movie. The villains, in particular, are excellent – Jabba really shows why he’s such a powerful mob boss by seeing right through all of the rescue plans that our heroes concoct. (And Leia shows how awesome she is by strangling him with her own chain the first opportunity she has – there’s a metaphor there for sure.) Vader’s redemption arc is extremely satisfying and the Emperor is an appropriately terrifying puppetmaster. The other thing I love about Return of the Jedi is the worldbuilding – between Endor, Jabba’s lair, and the new Death Star, we get awesome sets, puppets, and costumes in a way that feels really physical and real. Writing this has definitely been clarifying. Basically, there are things about Star Wars that are problematic – the lack of non-white, non-male-bodied characters and the racist representation of the ones we get, for (glaringly obvious) starters. 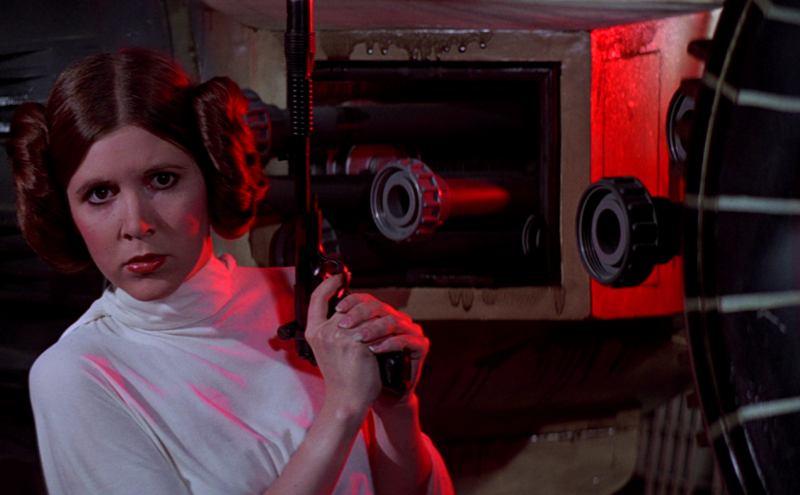 On the other hand, Leia is and has always been awesome and is definitely a huge part of why Star Wars spoke to me at such a young age (besides her tolerance of men who do whatever they want, regardless of whether they have her consent – but a lot of women find themselves in that position and I would never blame her for Han’s jerk behavior). The worldbuilding is fantastic – I especially love all the physical props of the old movies (the 2000s CGI was not great; I’m more ambivalent about the newest movie graphics). More than anything, though, I love Star Wars because it opened for me (my past self, sitting on my grandparents’ bed, transfixed; my present, seeking feminist sci-fi and writing this review; my future selves, whoever they are…) the pandora’s box of science-fiction, where anything is possible: ships can be world-destroyers or hunks of junk, princesses can shoot blasters, and the galaxy is strange and ordinary all at once. Posted on December 12, 2017 June 6, 2018 Categories extemporaneous reflectionsLeave a comment on I have a lot of feelings about Star Wars.